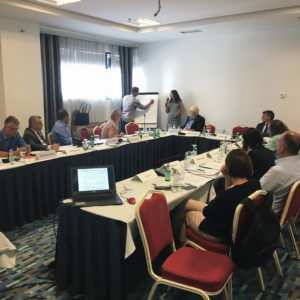 A collaborative workshop was organised on August 24th in Pristina, Kosovo, to jointly discuss the main findings from a profiling exercise aiming to produce evidence on different IDP populations in the country to inform durable solutions planning and programming. JIPS supported colleagues in DRC to facilitate the workshop and group work. At JIPS we have experienced that this step of jointly agreeing on the profiling findings in the final stage of a profiling exercise is very crucial and at the same time often overlooked. Ensuring that partners of a profiling exercise discuss together and agree upon the conclusions drawn from the findings is central to making the results useful and used. Thus, this workshop marked a central phase of the collaborative process between Serbian and Kosovar authorities, and various international organisations and NGOs. The workshop was well attended, including participation by the Ministry for Communities and Return (MCR), the Serbian Commissariat for Refugees and Migration (SCRM), the Kosovo Agency for Statistics (KAS), the UN High Commissioner for Refugees (UNHCR), the Danish Refugee Council (DRC), the International Organization for Migration (IOM), the UN Development Programme (UNDP) and the UN mission in Kosovo (UNMIK). The profiling exercise was initiated in 2013 by MCR, UNHCR, and DRC, after which a Profiling Management Group was set up including SCRM and KAS to oversee the exercise. Throughout the process consultations with a broader membership of the Profiling Working Group have been held, including IOM, UN Children’s Fund (UNICEF), UNDP, the Organization for Security and Co-operation in Europe (OSCE) and UNMIK. Collaboration characterised each stage of the profiling process, from agreeing on the exercise objectives, the baseline mapping, developing the methodological approach including themes and indicators, the implementation of the data collection, and formulation of the findings and conclusions. JIPS has been supporting the exercise since its inception. The profiling has also been an important pilot for the project on measuring progress towards durable solutions, with some of the key indicator modules tested with IDP communities in Kosovo. The workshop discussed the most important findings of the profiling exercise, including main population trends, vulnerabilities, and durable solutions, and agreed upon a set of conclusions based on these findings. The final report is expected to be released in October 2017.